The pathophysiology of idiopathic intracranial hypertension (IIH) is poorly understood. A recent MRI study of sinovenous stenoses showed a high prevalence of transverse sinus stenoses in patients with IIH compared with a control population.1 However, it remains unclear whether these appearances represent a cause or a consequence of IIH.2 The following case report illustrates radiologically the changing morphology of the cerebral venous sinuses associated with a case of treated IIH. A 19-year-old woman presented with a 2-week history of headache, blurred vision, and diplopia. One week before onset of headache she had taken oral penicillin for 2 days for a presumed right ear infection. Medical history was unremarkable, and she was on no medication; in particular, she had never taken the oral contraceptive pill, vitamin A supplements, or tetracycline. On examination, she was overweight (body mass index, 27), normotensive (104/57 mm Hg), and had bilateral 6th cranial nerve palsies, severe bilateral papilledema, reduced visual acuity (VA) (6/9 on right, 6/24 on left), and markedly constricted visual fields with impaired color vision. There were no other neurologic findings. Unenhanced CT and MRI of brain were normal. Lumbar puncture on the day of admission revealed an elevated CSF opening pressure of 67 cm (normal <20) with normal CSF constituents. CT venography performed the following day demonstrated severe narrowing of both distal transverse sinuses with no evidence of intracranial venous sinus thrombosis (figure, A).3 Electrolytes, calcium levels, and full blood count were normal. Figure. (A) CT venogram at initial presentation showing severe narrowing of both transverse sinuses. (B) Repeat CT venogram 6 days after insertion of lumboperitoneal shunt, showing marked improvement in degree of narrowing bilaterally. A diagnosis of IIH was made. After lumbar puncture, a transient improvement in headache and VA was noted (6/5 on right, 6/12 on left). Oral acetazolamide (500 mg twice daily) was initiated. On day 4, because of worsening headache, a second lumbar puncture was performed, showing an opening pressure of 63 cm with normal constituents. Vision deteriorated further (VA 6/6 on right, 6/36 on left), and retinal edema and hemorrhages appeared. Lumbar CSF pressure monitoring was performed, showing pressures of 30 to 50 mm Hg and multiple “B” waves. Risk of permanent visual loss resulted in emergency lumbar-peritoneal shunt insertion on day 6. Visual function improved (VA 6/9 on the right, 6/18 on the left) within 48 hours, with improvement in papilledema and color vision. She developed postural headaches indicative of a low CSF pressure state. 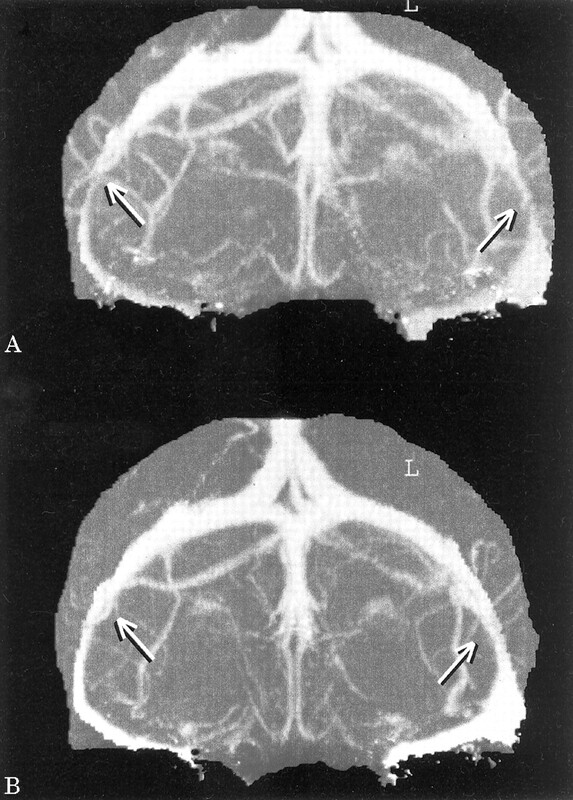 CT venogram was repeated 6 days after shunt insertion and showed a marked reduction in the degree of transverse sinus narrowing bilaterally (figure, B). The patient was discharged headache-free with improved visual function (VA 6/9 on right and 6/12 on left). The effect on venous sinus caliber of acutely decreasing CSF pressure has not been previously demonstrated using CT venography. Our findings illustrate and support the hypothesis that increased intracranial pressure (ICP) can cause collapse of the walls of the transverse sinus.5 This transmural gradient may exacerbate increased ICP by causing a functional venous outflow obstruction. When CSF pressure is then decreased, the walls of the venous sinus are allowed to expand, and the venous pressure gradient decreases acutely. Attempts to treat IIH patients with transverse venous stenoses by stenting have reported improved symptoms and signs in some, although this observation does not exclude venous stenosis simply being a secondary effect of increased ICP.6,7⇓ The intricate relationship between increased ICP and venous sinus outflow obstruction remains to be elucidated. The authors thank Dr. L. Dunn, consultant neurosurgeon, and Dr. R. McFadzean, consultant neuro-ophthalmologist, Southern General Hospital, Glasgow, UK. Farb RI, Scott JN, Mikulis DJ, et al. Idiopathic intracranial hypertension: the prevalence and morphology of sinovenous stenosis. Neurology. 2003; 60: 1418–1424. Silberstein S, McKinstry RC 3rd. The death of intracranial hypertension? Neurology. 2003; 60: 1406–1407. Casey SO, Alberico RA, Patel M, et al. Cerebral CT venography. Radiology. 1996; 198: 163–170. King JO, Mitchell PJ, Thomson KR, et al. Cerebral venography and manometry in idiopathic intracranial hypertension. Neurology. 1995; 45: 2224–2228. King JO, Mitchell PJ, Thomson KR, et al. Manometry combined with cervical puncture in idiopathic intracranial hypertension. Neurology. 2002; 58: 26–30. Owler BK, Allan R, Parker G, et al. Pseudotumour cerebri, CSF rhinorrhoea and the role of venous sinus stenting in treatment. Br J Neurosurg. 2003; 17: 79–83. Higgins J, Nicholas P, Owler BK, et al. Venous sinus stenting for refractory benign intracranial hypertension. Lancet. 2002; 359: 228.